Encore For James, under jockey Jaime Leos, winning the last of nine trials for the Grade 2 West Texas Futurity at Sunland Park Racetrack & Casino on Friday. 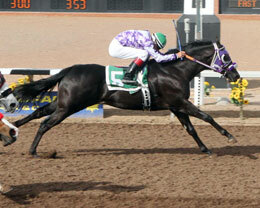 SUNLAND PARK, NM�MARCH 21, 2014�Leading sire IVORY JAMES sired two finalist Friday afternoon from 87 two-year-olds who participated in nine trials to the Grade 2 $309,091 West Texas Futurity at Sunland Park Racetrack and Casino on Friday afternoon. The 10 fastest qualifiers will return to the Southeastern New Mexico racetrack on Sunday, April 13 and vie for the $145,277 winner's purse over a 300 yard course. The second 10 fastest are preferred invites to the $50,000 West Texas Juvenile Invitational to run Saturday, April 12 at Sunland Park. Encore For James posted a half-length win in the final trial to clock a :15.282 time and become the 8th qualifier. Chris Zamora conditions the IVORY JAMES colt. Victor Lazano purchased the brown out of Grade 3 winner Rare Encore, by Rare Form, for $23,000 from Thomas Bradbury at the Ruidoso Summer sale. Vaughn and Jill Cook is the breeder. Jaime Leos had the riding assignment. Whos Kissin James, a Thomas Bradbury and Lisa Beauprez Oklahoma-bred daughter of IVORY JAMES finished second in the fourth trial to get the final clocking of :15.347. Gene Burden saddled the $17,000 Heritage Place September Sale Graduate for owner Joe Rios. Sergio Becerra, Jr. rode the bay filly out of stakes-placed Whos Kissin Who, by Takin On The Cash. For a complete list of West Texas Futurity(G2) finalists, times, sires, dams, owners, breeders, trainers and jockeys CLICK HERE. Redneck Baptism put in a solid effort to finish a close third in the 9th trial and earn and invite to the $50,000 West Texas Juvenile Invitational for owner Luis Rogelio Nava. Also trained by Burden and ridden by Becerra, Jr., the WAVE CARVER filly was bred in Colorado by Red Cactus Horses, LLP. The sorrel miss is out of Redneck Cowgirl, by The Signature. For the West Texas Juvenile Invitational list CLICK HERE.